Plaid shirts will always represent for me Kurt Cobain, riot grrrls and grunge music. That's because I'm self-centered and lived my twenties in the '90s. But today when I see my husband putting on a plaid shirt, it inspires entirely different connotations. He couldn't be less grunge, but he is a certified geek. And it suits him perfectly. A gentleman in a plaid shirt seems to have found a way to wear colors and patterns in a decidedly manly fashion—much like the Scottish in their Black Watch kilts. It's a method for being flamboyant within the structure of straight lines and right angles. Floral might be out of bounds, but with plaid, a man can be sartorially bold and colorful but not effeminate. I'm not sure if masculine flamboyance is what inspired the first plaid shirt, which emerged from Pendleton in 1924. But it's a good way to describe the first plaid fabric, which was what we think of today as "tartan." Sixteenth-century Scottish warriors wore plaid cloaks thrown over their shoulders and later belted the patterned wool fabric into a skirt known as a "belted plaid" or kilt. Scottish highlanders identified themselves by the checkered pattern when they fought against the English government. The Brits eventually banned Tartan because of its rebel connotations (worry not, it is now lawful to wear plaid in the U.K.). The emergence of "sportswear" for men in the 1940s might not exactly be rebellious, but it was a cultural shift and a statement against wearing stuffy suits all the time. The original Pendleton plaid was worn mainly by laborers and for hunting and other outdoorsy endeavors. But after World War II Pendleton's woven woolen button-up plaid shirts became a weekend staple for men, and it didn't take long for women to start stealing the shirts off their men's backs. So in 1949, Pendleton created the "49er" specifically for women, which in turn launched the company into women's wear (which, just as an aside, culminated in an amazing collaboration with Opening Ceremony in the last few years and continues to be awesome with the Portland Collection). In the '60s, the surfer set adopted the wool Pendleton shirt as a jacket for pre- and post-wave-catching activities. 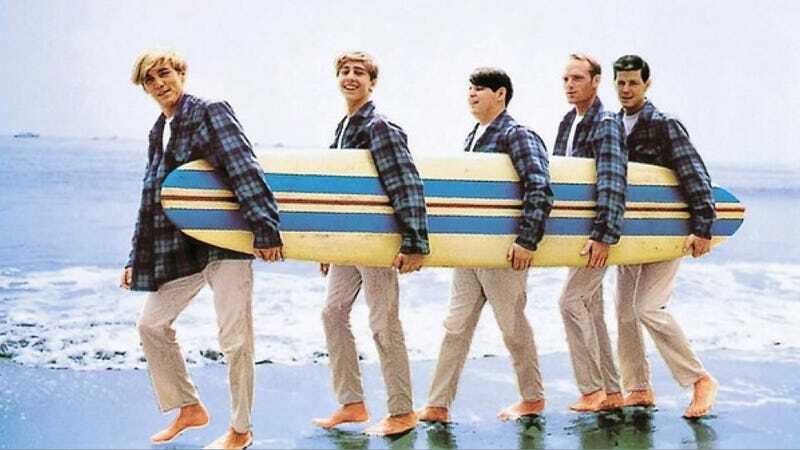 The Beach Boys immortalized Pendleton's "shirt jack" style on the cover of their Surfer Girl album, and a girl band called The Majorettes serenaded the look in their single "White Levi's." During a recession Americans tend to embrace our roots, and in the '90s that meant grunge bands like Nirvana, Pearl Jam and Soundgarden wearing open-fronted plaid flannel shirts reminiscent of the American blue collar worker. The style came full circle with Marc Jacobs' landmark 1992 collection featuring thermal shirts in cashmere and plaids in silk. In the past several years we've seen another recession, and again designers and clothing-wearers have embraced worker chic. Fashion critics have remarked repeatedly on the return of '90s grunge, and brands like JCrew and Ben Sherman have more plaid offerings than ever. Pendleton has 37 men's patterns available for fall 2012 available in three wool weights, not to mention some lovely women's shirts, jackets and skirts. An unscientific survey of Gizmodo guys shows that the majority of staffers enjoy a plaid shirt. Some wear them almost exclusively (Andrew Liszewski) and others are in plaid shirt training (Brent Rose). Mat Honan wears them to look youthful, and Joe Brown wears them to hide stains. Says Sam Biddle: "Love 'em. Great for both casual and dressier occasions. Versatility!" He's always good for a quote. Jesus Diaz, needless to say, only wears silk shirts that show his copious chest hair (Mr. Jacobs might have something for him). Sadly I don't get to see these fine gentlemen in person on a daily basis, but their masculine flamboyance is positively palpable through our web communications.